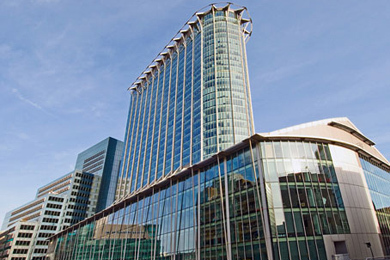 SGCI has a long standing working relationship with the facilities management companies and tenants occupying City Point, London and continue to provide regular maintenance, consultancy and installation services. As a recommended approved installer and service provider, SGCI was engaged to carry out the BMS upgrade of levels 23 and 24 working alongside both electrical and mechanical contractors. As the two floors were originally controlled by separate building management and lighting control systems (TAC Vista, JCI Metasys and Philips UniLON), new LON routing hardware and cabling was installed and a new LNS database generated to allow for complete system management from a single GUI 'head end'. In addition to HVAC control, the new BMS solution also incorporated connectivity with the on-floor Delmatic lighting controls (installed by the electrical contractor as part of this upgrade) to form a fully integrated system utilising LonWorks technology. The original level 24 LON FCU controls were retained however those for the whole of level 23 were retro-fitted with Honeywell W7754 LonWorks Fan Coil Controllers. Two new zone control panels were installed to allow for network expansion of the original system as well as providing controls and monitoring of several new extract fans installed. An upgrade of existing obsolete zone valve actuators was also undertaken and additional valves and actuator sets installed for isolation of additional supplementary CHW services.